Mountain spring tomato plants often give gardeners their first taste of fresh, tasty fruits in mid-summer. As a medium-early tomato, mountain spring plants thrive in almost any garden as long they receive plenty of sunlight and frost-free days. Ripening in just 65 to 75 days from the date of planting, the deep red, mild, crack-resistant fruits taste great fresh, canned or cooked. A medium-early ripening tomato, mountain spring falls into the determinate category, meaning the plant blossoms at the top. This allows the plant to stop growing upward and instead put its energy into growing fruit. Mountain spring tomato plants grow up to four to five feet in height. In just 2 1/2 months from sowing seeds, gardeners harvest the first deep red, smooth and flavorful tomatoes. All tomato plants require full sun to grow and produce mature fruits. Whether grown from seeds or transplanted from containers, plants should be spaced about 18 inches apart. Right after plants are transplanted into the ground, they need to be staked to keep the leaves and branches off the ground to prevent loss of fruit. Wire tomato cages also work well to support the plants. The plants should be watered thoroughly after planting. Regular watering with more frequent watering during hot summer days or periods of drought help keep the tomatoes from cracking during the growing season. Adding a layer of mulch after thoroughly watering the plants helps to retain moisture. Laying plastic sheeting around the tomatoes helps keep weeds down while retaining moisture and keeping soil temperatures higher. Once picked, tomatoes need to be stored at room temperatures to keep their flavor intact. If an early frost threatens the tomato crop, the green fruits may be harvested before they’re ripe. The greenest tomatoes work well in dishes calling for fried green tomatoes, while fruits showing a hint of red may ripen if left on the kitchen counter. 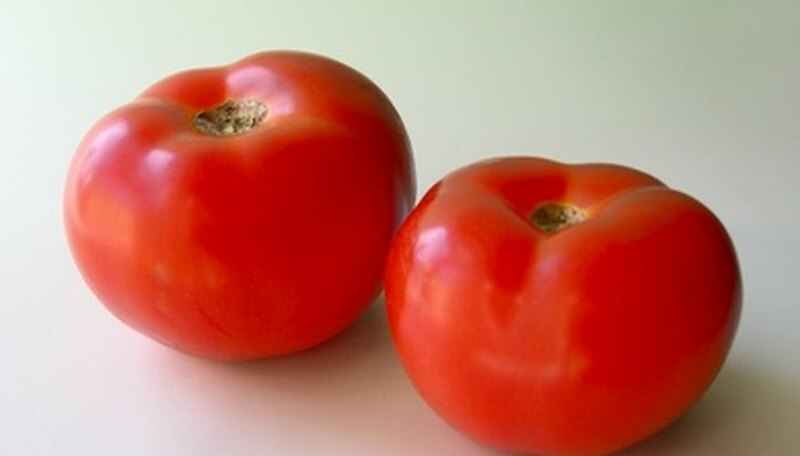 To speed up the ripening process, place the tomatoes in a brown paper bag or in a special fruit-ripening bowl. High in vitamin C, mountain spring tomatoes taste great eaten fresh right off the vine. The tomatoes also work well in dishes calling for fresh tomatoes such as in bruschetta or cooked dishes featuring pasta, vegetables, soups and fish and other seafood. The tomatoes also taste great canned or juiced.